Jodi Stemler Consulting is supporting the Sage Grouse Initiative by writing for their Science to Solutions series. These 4-page reports translate complex scientific information so that it can be clearly understood by a diverse audience and connects the research with specific conservation activities being carried out by SGI. 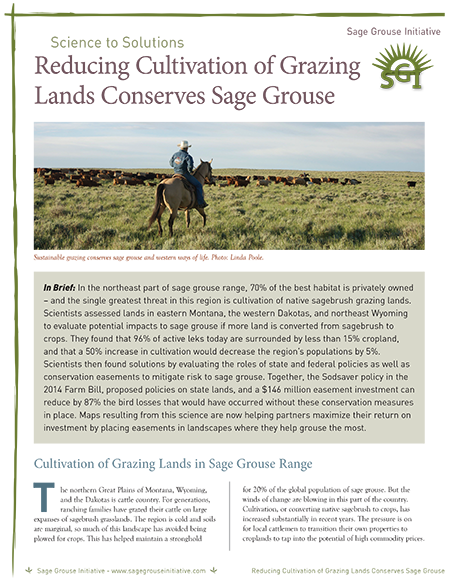 The first Science to Solutions document written by Jodi, Reducing Cultivation of Grazing Lands Conserves Sage Grouse, that assesses the potential for conservation easements and policies to reduce the risk of cultivation of sagebrush habitats was released in July 2015. The second Science to Solutions document written by Jodi, Sagebrush Songbirds Benefit from Sage Grouse Habitat Restoration, was released in September 2015. This report outlines how conifer removal projects in southern Oregon have improved abundance of other songbirds of conservation concern. The third Science to Solutions report written by Jodi, Grazing and Sagebrush Treatments: A 25-year Case Study in Utah, was released in January 2016. This report assessed rangeland in northeast Utah, comparing how active grazing and sagebrush management can benefit sage grouse populations. In August 2016, SGI released Sagebrush Rangelands Help Maintain Water Availability, the fourth Science to Solutions report written by Jodi. This study documented that sagebrush rangelands hold water in an ecosystem for an average of nine days longer than areas with conifer cover. The latest Science to Solutions report came out on August 28, 2017. Grazing Management in Perspective: A Compatible Tool for Sage Grouse Conservation describes a new study that evaluates whether grazing management effects sage grouse nest success.